RSGC provides an academically advanced curriculum especially designed with boys in mind. Our faculty is highly trained to meet the unique needs and interests of our all-male student population and the curriculum has been tailored to suit these strengths. 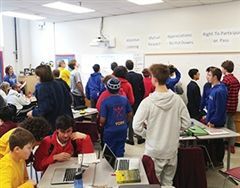 As a boys' school, we take great pride in the holistic, experiential approach to learning that we offer the boys from Grade 3-12, which resonates in the daily lessons they experience in all their subjects. Community outreach and problem-solving form the core of our curriculum. Our Design Engineering Studio offers boys of all ages a chance to interact over the building of the next great invention. Our boys are fully immersed in the Arts - including instrumental and choral music, drama and visual art, both as technicians and as observers - areas that may be far more densely populated by girls in co-educational settings. Royal St. George's College is an urban day school that combines academic excellence with a stimulating and supportive environment. Founded in 1964, the mission of our College is to challenge and inspire each boy to become the best version of himself. Philanthropy at RSGC allows the College to fund projects not covered by tuition fees and further enrich the experience of our students. A Great Week of Spirit! Spirit Week is one of the year’s most anticipated and fun weeks of the year. 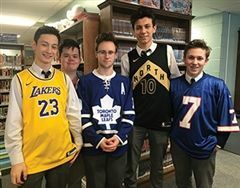 The Grade 7s recently finished a project called 1 to 100, where each boy received a unique set of four numbers and was tasked to use those numbers and their math concepts to create 100 equations that resulted in the answer of every single number between 1 and 100. A big part of Senior School life is Advisor Groups. 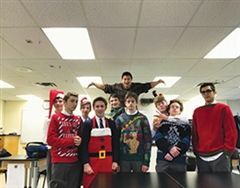 The groups get together once a week and are led by a teacher who serves as the advisor of the same group for the majority of a student’s Senior School experience. On February 7, members of our community came out to showcase their talents. 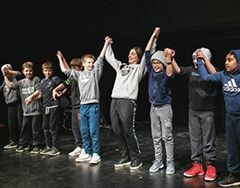 Teacher Cathie Gryfe-Seeley, who has been both an organizer and a performer, was incredibly impressed by this year’s show and proud of the performers. 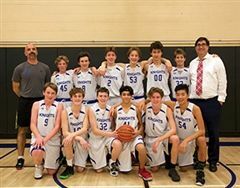 The U16 basketball team, with co-coaches Mike Ruscitti and Peter Sarellas, had an incredible regular season with an 8-0 record. Mr. Ruscitti, who has been coaching at the school for the past eight years, can’t remember going undefeated. So, what has made this team work so well together? “I can’t get my son to read.” This is a lament English teachers sometimes hear from exasperated parents, worried that their sons are not developing the literacy they need to succeed.